911 is on the left. Completely unrelated to the mid 90s ECW wrestler. 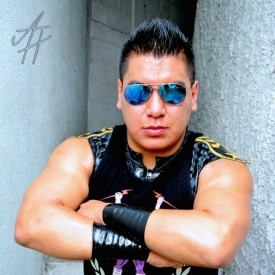 Talented wrestler who began working IWRG shows under the Comando Mega gimmick, a natural rival for Los Megas. After losing his mask he pretty much just kept working undercard tag matches and even made the odd appearence on one or two CMLL shows @ Arena Coliseo. In 2007 he was put into the new version of Los Oficiales under the 911 gimmick and the group has been wildly successful. They continue to be a key part of any IWRG shows. This page was last edited on 1 July 2017, at 16:47.